MiVIP Surgery Centers will open a surgery facility at 5950 S. Durango Drive Sept. 20. The new center will offer a new robotic da Vinci XI Surgical System in an outpatient setting. Doctors at miVIP provide minimally invasive surgeries for weight loss, acid reflux, sleep apnea and other conditions within the specialties of general surgery, gynecology, urology and ear, nose and throat. A ribbon-cutting ceremony is planned for Thursday, Sept. 20, from 6 to 9 p.m. at the center. 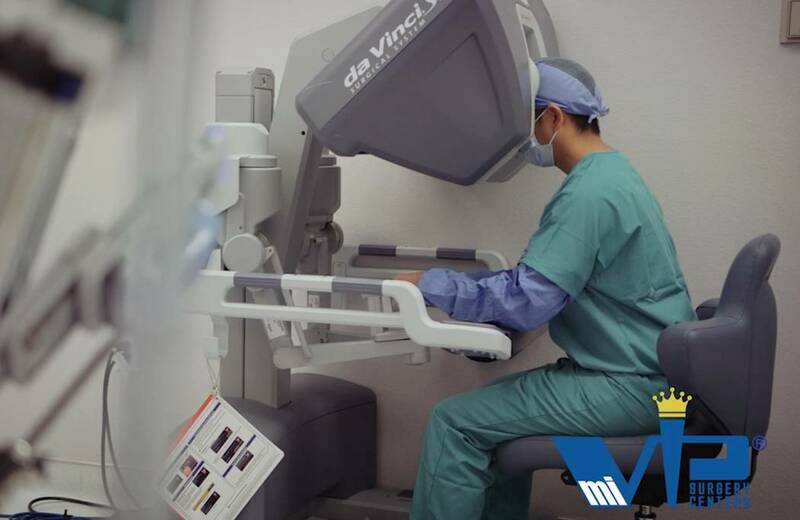 MiVIP Surgery Centers are a network of outpatient surgery centers providing minimally invasive procedures in multiple specialties, including bariatrics, gastroenterology, general surgery, gynecology, ENT (ear, nose and throat), orthopedics, podiatry, spine health and urology. With locations in California, Nevada, Florida and New York, miVIP facilities are equipped with robotics and other innovative technologies. A ribbon-cutting ceremony was held Sept. 7 to celebrate the grand opening of Solutions Recovery — McLeod, a drug and alcohol treatment facility, specializing in medical detox and inpatient residential care. The 48-bed facility is at 4011 McLeod Drive. It joins the American Addiction Centers’ family of internationally accredited treatment centers in Las Vegas. Another feature of the facility’s commitment to patient care is the use of EarlySense. McLeod is one of a select few treatment centers in the country utilizing the state-of-the-art technology EarlySense, a contact-free patient monitoring system that improves patient safety during detox. Through sensors placed underneath the patient’s mattress, vital signs such as movement, heart rate and respiratory rate can be analyzed and supervised by medical staff. Using EarlySense, any sign of patient deterioration during the detox process can be assessed quickly. Urology Specialists of Nevada has announced that Dr. Jason Zommick received recognition as a Rezūm System Center of Excellence for his expertise in treating benign prostatic hyperplasia, or enlarged prostate. Zommick surpassed the milestone of treating 100 patients with the Rezūm System, providing improved quality of life for men suffering from lower urinary tract symptoms caused by BPH. The Rezūm System a minimally invasive treatment option for men suffering from BPH that does not require general anesthesia. Zommick, a board-certified urologist, offers Rezūm as an in-office BPH treatment option. Developed by NxThera, Rezūm is performed in a clinic or out-patient setting. Rezūm uses the natural thermal energy stored in water vapor or steam to treat the extra prostate tissue that is causing BPH symptoms such as frequency, urgency, irregular flow, weak stream, straining and getting up at night to urinate. Urology Specialists of Nevada is one of the largest urology groups in Southern Nevada with 14 providers and four locations. The practice has been serving Southern Nevada since 1996. Desert Radiology, a diagnostic imaging company that has served Southern Nevada for over 50 years, opened a new outpatient-based imaging facility at 3175 St. Rose Parkway, Suite 130, in Henderson. This is the company’s ninth location, and second in Henderson. The new 5,000-square-foot imaging facility will offer a variety of diagnostic imaging, including general radiology (X-Ray), CT scans, DEXA bone density scans, MRI scans, nuclear medicine and ultrasounds. Desert Radiology serves approximately 30,000 patients monthly across all its outpatient facilities in Las Vegas, Pahrump, and Henderson. Risas Dental and Braces has expanded its footprint with its first Nevada location in North Las Vegas, which is slated to open Sept. 22. It is the first of two locations planned in the Las Vegas area this year. No opening date has been set for the second location. To celebrate its grand opening, the office will provide free dental services Sept. 22 from 8 a.m. to noon. Services include teeth cleaning, cavity filling, tooth extraction, exam with X-rays. “North Las Vegas is known for its civic pride, something we display in every community we’re a part of,” said Managing Director Jeff Adams. Since its inception in 2011, Risas Dental and Braces has donated $3.5 million in dental care and continued to further its primary mission of making oral health care accessible and affordable for all. Risas Dental and Braces has offices throughout Phoenix, Tucson and Denver. The new office is at 2500 E Lake Mead Blvd. Sunrise Hospital and Medical Center has received its reverification of its Level II Trauma Center by the American College of Surgeons. The Verification Review Committee — a group within the Committee on Trauma of ACS — came to Sunrise Hospital earlier this year for an on-site review. The on-site review and recent follow-up committee evaluation serves to verify the Trauma Center’s efforts to improve the standard of care as outlined by ACS’s Resources for Optimal Care of the Injured Patient manual. Evaluation includes the entire spectrum of care to address the needs of all injured patients from the prehospital phase through the rehabilitation process. The American College of Surgeons is a scientific and educational association of surgeons commencing in 1913 to raise the standards of surgical education and practice and to improve the care of the surgical patient. The college has over 72,000 members and it is the largest association of surgeons in the world. Longstanding achievements have placed the ACS in the forefront of American surgery and have made it an important advocate for all surgical patients. Sunrise Hospital first received Trauma Center Level II verification in 2005. It is a regional referral service receiving the largest volume of EMS transports in Nevada including the treatment of more than 3,000 traumatically injured patients in 2017. The Joint Commission has awarded Desert Hope Treatment Center its Gold Seal of Approval, an internationally recognized symbol for health care quality. The accreditation by The Joint Commission signifies that Desert Hope has demonstrated its compliance with performance standards and commitment to providing safe, effective care. The dual-diagnosis curriculum employed by the expert medical staff at Desert Hope is complemented with the use of industry best practices and addiction therapy types. Individual, customized treatment plans are utilized to ensure that patients are wholly treated — co-occurring mental health disorders, ongoing health issues and personal history are taken in to account when developing a tailored plan. The addiction professionals at Desert Hope provide patients with informative recovery tools, resources and education for successful treatment and prolonged recovery. To obtain accreditation, Desert Hope underwent an extensive review process, which included a rigorous on-site survey. The facility demonstrated compliance with behavior health care standards related to several areas including treatment and services; environment and care; leadership; and screening procedures for early detection of imminent harm.